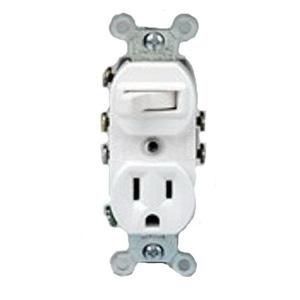 Leviton Duplex style 3-Way AC combination receptacle/switch device in white color, has voltage rating of 125-Volts/120/277-Volts and current rating of 15-Amps. This AC combination receptacle/switch has power rating of 1/2 hp at 120-Volts. Silver cadmium oxide contacts of this switch prevent sticking, welding and excessive pitting, while the double-wire contacts of receptacle ensure maximum conductivity. Commercial-grade AC combination receptacle/switch features thermoplastic body for longer endurance. It measures 4.2-Inch x 1.62-Inch. Side-wired connection configuration of this grounding AC combination receptacle/switch accommodates 12-AWG size wires. It features steel strap for making mounting and installation easier. It withstands temperature of -40 to 120 deg C. It has flammability rating of V-2 per UL94 to withstand harsh environmental conditions. This AC combination receptacle/switch has NEMA rating of 5 - 15R for added safety. AC combination receptacle/switch is UL listed and CSA certified.